Feel the love with gorgeous gin trails, tree top retreats, cosy cabins and beautiful buys. Elysia Agnew takes us on a dreamy do-this guide to perfecting Valentine’s celebrations in the North East and beyond. 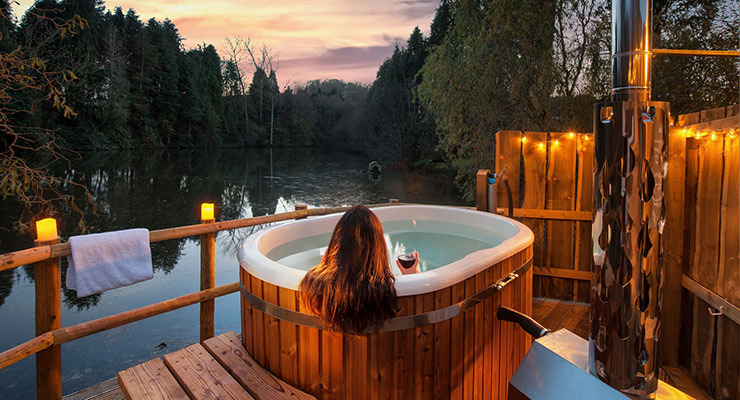 Glen in Hampshire, offering treehouse escapes for couples, families and groups of up to eight people. 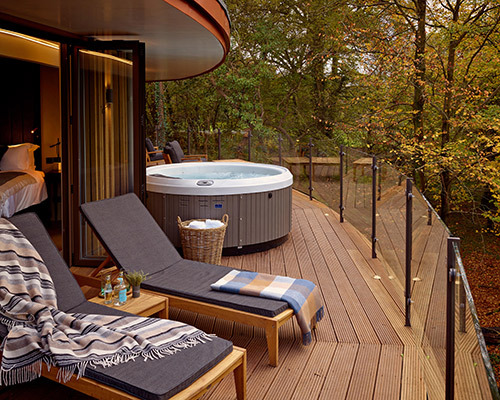 Suspended 35 feet in the trees, you can take in stunning forest views as you soak up the enchanting atmosphere in the hot tub, watching as the sun sets through the branches. There’s a log burner in each suite, meaning it’s the perfect getaway for cosying up during winter months. Time to switch off for a staycation in a secluded Somerset sanctuary. Is there anything more romantic than a snuggly shepherd’s hut complete with chocolate treats and fresh flowers? Escape the everyday and get lost in a whimsical cabin on the water’s edge. The Shepherds Hut Retreat invites couples to get toasty by fire pits, star gaze in the hot tub and feel at one with nature, in the most indulgent surroundings. Complete with fully-fitted kitchen, all the mod-cons you’d expect from a swanky city pad, and stunning vintage furnishings, this beautiful bolthole is a Valentine’s must. If gin is the key to your heart, we’ve got some doorstep distilleries that promise to get you in the spirit. Start at Raisthorpe Manor in North Yorkshire, a distillery with a love of all things local. Served in Harvey Nichols cocktails, stocked in Barkers Northallerton and sold in their store at the McArthurGlen outlet in York, this gin has gone from family recipe to nationwide recognition in no time. Next up, it’s a visit to the Rare Bird Distillery in Yorkshire’s foodie capital of Malton. 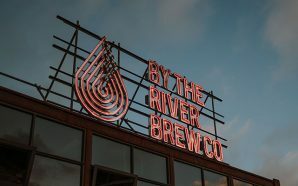 ‘Florence’, the site’s 300 litre copper still, serves up the goods, while the Rare Bird Gin School takes sippers to the top of the class with tastings, demonstrations and gin-making sessions. Leave with your own unique blend – it doesn’t get more romantic than that. Our final tipple stop is in Bedale, the home of Masons Gin. Whether it’s the original dry gin, the lovely lavender flavour, or the Yorkshire tea edition, these cool and quirky spirits make for the perfect gift. A pooch is the perfect valentine. Bring them bundles of love and treat them to something special this winter. Spoil someone special with a sumptuous Valentine’s Day dinner at the Lord Crewe Arms in beautiful Blanchland. Those with a shared love of food can indulge in an intimate three-course supper in the charming Bishop’s Dining Room. The Lord Crewe Arms is one of the most romantic hotels in the region. Why not upgrade for the evening and wind down in the warmth of the homely, hideaway bedrooms? Swinton Cookery School has scheduled the ultimate seafood masterclass for couples that like to get creative in the kitchen. Prep, fillet and present some of this season’s finest fish, and take top tips away with you to help incorporate sumptuous seafood into your new year diet. Search for the stars this Valentine’s Day at Kielder Observatory – and watch as the Northern Lights (or Aurora Borealis) light up the night sky. Nothing spells out romance more than a bit of stargazing at this stunning Northumberland spot. Get to grips with the science and stories behind the lights and share one of the wonders of the world with a loved one. For a pretty-as-a-picture date night, The Gallery at Sketch London tops the list. Make your way to this majestic Mayfair venue for an a-la- carte dinner that has luxe written all over it. It’s pretty, it’s playful, and it’s as pink as pink can be! Dishes include lobster gratin, Sketch tartare, venison-and-foie-gras pie, and vegetable poké bowl. The candy floss-style interior, plush velvet furnishings and funky artworks make for one of the most Instagrammable spots in town. City breaking with a loved one this season? Swing by Harvey Nichols in Leeds for high-rise sipping that’s sure to steal your heart. The Classic Pink: Rhubarb Liqueur with rhubarb bitters, white sugar cube and Harvey Nichols Rosé Champagne.